This is NOT an image of Duncan Stroik's new shrine to the Sacred Heart at the St. Louis Cathedral Basilica. I have not been able to find an image of it, yet. Having reflected at some length on the devotion to the Sacred Heart of Jesus and its central place in our daily Christian living and, therefore, in our Lenten observance, I am happy to announce that a shrine of the Sacred Heart of Jesus will be installed in the Cathedral Basilica of St. Louis. The image of the Sacred Heart will be enthroned in the shrine. At the time of the enthronement, I, together with representatives from throughout the archdiocese will solemnly consecrate the archdiocese to the Sacred Heart of Jesus. As I understand, there had been a statue of the Sacred Heart of Jesus in the cathedral basilica, but, at one point, it was removed and never replaced. 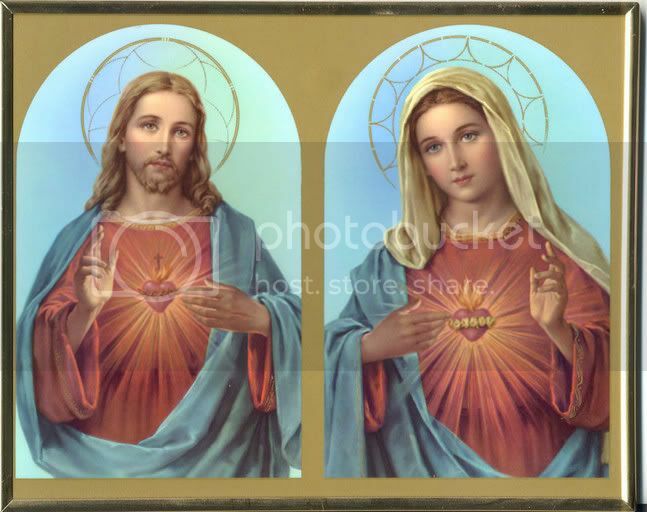 Although there is a symbol of the Sacred Heart of Jesus and the Immaculate Heart of Mary, as it appears on the back of the Miraculous Medal, in the mosaics of the cathedral basilica, at the top of one of the central arches, there is no proper area of devotion to the Sacred Heart of Jesus. The enthronement and the act of consecration will take place in the cathedral basilica at the regular 5 p.m. Mass on this coming June 17, the Sunday after the Solemnity of the Sacred Heart of Jesus, which will be celebrated on June 15. Since June 17 is a Sunday of Ordinary Time, it will be possible to celebrate the Votive Mass of the Sacred Heart of Jesus. The choice of the Sunday afternoon Mass will make possible the participation of priests and other members of the faithful from all of our parishes and Catholic institutions. Please mark your calendar for June 17 with an appointment to participate in Holy Mass at the cathedral basilica at 5 p.m, during which the image of the Sacred Heart will be enthroned and the archdiocese will be consecrated to the Sacred Heart. Following the Mass with the solemn enthronement and act of consecration, there will be a reception in Boland Hall, the parish hall of the cathedral basilica parish. The reception will provide a good opportunity for those participating in the joyous event to visit with one another. The shrine of the Sacred Heart of Jesus will be installed in the west transept of the cathedral basilica, directly across from the baptistery and ambry, which are in the east transept.The space for the shrine is ample without necessitating the removal of any pews or disturbing, in any other way, the present ordering of the space in the cathedral basilica. The image of the Sacred Heart of Jesus has been created by the Vatican Mosaic Studio. It is modeled after the image of the Sacred Heart in the Archbishop's Residence, which has been reproduced in various sizes for the devotion of the faithful. It is also on the holy card with the Morning Offering, which is distributed by the archdiocese. The mosaic image of the Sacred Heart will be placed in an altarpiece made of marble from Pietrasanta in Italy. The shrine will include stands with votive candles to represent our prayers continuously lifted up to the glorious Heart of Jesus. The shrine has been designed by Duncan G. Stroik of the School of Architecture at the University of Notre Dame in South Bend, Ind. He is internationally known for his design of beautiful churches and chapels, in accord with the long tradition of sacred architecture, at an affordable cost for the parish or Catholic institution. His design of the shrine of the Sacred Heart is truly beautiful and, therefore, inspiring. The shrine of the Sacred Heart of Jesus at the Cathedral Basilica of St. Louis is being funded by gifts of the faithful of the archdiocese. The creation of the shrine is itself an exemplary act of the devotion to the Sacred Heart. If you wish to make an offering for the shrine, please be in communication with Msgr. Joseph D. Pins, rector of the cathedral basilica. Your offering is needed and will bear lasting fruit in the increased knowledge and love of the Heart of Jesus in the minds and hearts of all who will pray at the shrine. The devotion to the Sacred Heart of Jesus is most rich in grace for a deeper knowledge of our salvation in Jesus Christ, a fuller participation in the sacramental and prayer life of the Church, and a stronger witness to Christ's living presence in the Church. It is my sincere hope that the installation of the shrine of the Sacred Heart in the cathedral basilica will be the cause of increased devotion among all of the faithful of the archdiocese and among the faithful from outside the archdiocese who visit our magnificent cathedral basilica throughout the year. Please pray that the enthronement of the Sacred Heart in the cathedral basilica and the consecration of the archdiocese to the Sacred Heart of Jesus will bring us abundant grace for the new evangelization. Please pray, too, that many will be inspired to enthrone the image of the Sacred Heart in their homes and to consecrate themselves and their homes to the Sacred Heart of Jesus.